Should You Start College Undeclared? It’s a question that every high school senior gets asked: what are you going to study/major in in college? If you have always known you wanted to go to medical school or you have always had a passion for teaching or some other thing, this question might be easy for you. For most incoming students, that question can be stressful. We have this idea that we are supposed to know what to do when we enter college, but not everyone does. Many people even change their majors through the course of college. So, I am going to talk about why it’s okay be undecided or undeclared while you figure things out. 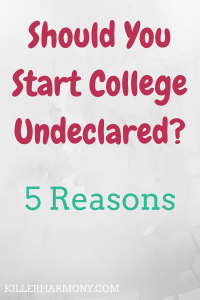 Here are some things to think about when deciding if you should start college undeclared. 1. You have multiple interests…that don’t fit together. In some cases, you can merge two different interests together when deciding what career to pursue. In some cases, they really don’t fit. Maybe your two biggest passions are music and law/political science. You would love to major in one or both of those subjects, but you aren’t sure how that would work. You might be able to pursue a double major, but that takes time, and both music and law are time consuming. Having multiple interests is certainly not a bad thing; it can only increase the chances of finding a career you enjoy. But at the start of college, it could be a good chance to explore those interests to see how far they go. 2. You have no clear career goal. This is nothing to be ashamed of, but having no goals for your degree means that declaring now could be a waste of your time and money. Maybe you decide that since you like drawing, art is what you should major in. But then you get into a semester full of art classes and realize you can’t do it all day. Going in undeclared gives you the chance to explore different subjects and fulfill general education requirements at the same time. Maybe your college has an anthropology class that can fill a social science credit. You can take certain electives to fill your basic requirements and open yourself up to new subjects you never thought of. It’s okay to not know what you want to do after college, and spending time getting those pesky general classes done means that when you do find your perfect major, you can dedicate more time to it. Even if you have a general idea of what you want to study, starting undeclared can give you more options. In some majors, you might be tempted to start those major requirements and put off the general education classes. Music is one of these, because of all of the progressive classes you have to take. The earlier, the better. But declaring a major like this and spending time in those classes only to realize it was never for you can be heart breaking…and wallet breaking. If you have some ideas of your interests but want to be open to new ideas, going in undeclared is a good choice. It’s okay to not want to commit. When you start college, you’re only 18. You’re barely an adult, and who can expect you to make decisions that could potentially make or break your adult life? 4. Your interests change a lot. I’m not going to say that changing interests is bad; I had a period of time where my career goals changed at least once a week. But if you change career interests as regularly as the days or weeks, it’s not a bad idea to put off that decision of choosing a major. Eventually, you will find an area of interest that is so strong and that you always find enjoyment with. That is a sign that you should declare that major. If you have yet to have that moment or you look at dozens of majors on the regular, spend some time undeclared. Use that time to explore all your interests and to talk to students and professors in those fields. What are the classes like? What types of jobs can you get? Do enough of the classes interest you? 5. The pressure of choosing is getting to you. If you just can’t stand the constant questions from well meaning family members or you don’t want to choose, it’s okay to go in undeclared. Feeling pressured is a good way to end up making a decision you might later regret. In our culture, we put so much pressure on high school seniors to know what their life goal is. We expect them to know just what they want to study and what they want to do after college. The only thing that does is stress out the people we think we’re helping. If you feel pressured to decide on a major, know that that pressure is part of life, but also that you don’t have to listen to it. If you know that undeclared is for you, do it. There’s no reason to make a hasty decision just because of something your crazy aunt or other relatives tell you. I wish I went in undeclared. I would have been able to consider more options than just the one thing I thought about when I was 17: the thing I thought I SHOULD major in. Have you been undeclared? What advice do you have for rising freshmen? Let me know in the comments or on Twitter (@HannahHaefele)!